What ONE Value Will Your Company Be Remembered For? 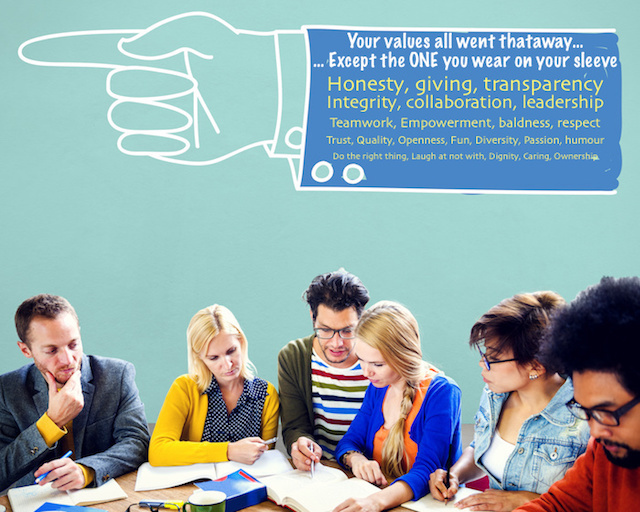 Whether or not you've done this, chances are that a list of corporate values adorns your company's website. You may even have them emblazoned on your walls with dolphins or dramatic landscapes, almost as if to stress how these values actually live somewhere else. Or you may be one of the lucky few whose company's culture demonstrates them on a daily basis. But I've noticed that regardless of which category a company falls in to, there's always one value that has pre-eminence over all the others. The one that the company consciously or subconsciously lives the most, and which ends up defining it. And that’s regardless of whether the company has actually articulated that particular value, or indeed any values at all. When I was on the board of Conchango, a consultancy / agency top 5 ranked by Forrester at the time, we had a number of company values articulated. I'd love to boast of their originality, but in reality, most companies who mention values would probably share most of them. For instance, 'Honesty': do you know a company that advertises its lack of honesty as a key value? Thought not, though I'll bet you can name a few that should. We also made a lot of 'Openness'. And I think we opened the kimono with our team wider than most, regardless of what beauty or ugliness lay within, or what discomfort it caused the wearer or the observer. 'Collaboration' ? Yup, it underpinned much of our success, but was still not "the one". So even though innovation was one of our values (which I think we absolutely lived), I can't say that it stretched to defining our set of values. Much as we loved these, there was always one other value that kept coming back. The one that tripped off the tongue in sales pitches, as much as within career development sessions, as much as after 6 or 7 Jaegerbombs at one of our community days. That value was the “can-do attitude”. Forgive us, this started in the 90s after all. But corny as "can-do" as a phrase was, it had life, and was reflected in a variety of ways. The Jaegerbomb Can-Do. If we'd employed barstaff, this they 'd have done this. The strength of “can-do” was such that it ended up outliving us. When many of the company’s employees departed post-acquisition, they started more than 30 companies of their own. That’s nearly 10% of the team going to set up their own businesses, let alone the additional numbers that worked in them. I haven't heard of that proportion of company starters from anywhere else I know. This wasn't just our consultants setting up other agencies and consultancies, although many have. Our training manager set up an excellent training company. Our internal recruiter set up a recruitment firm (and an innovative one at that! some of our values continued to run deep). Our marketing director set up a family website and directory in Perth. There are 2 charities I'm aware of. And as for the more than two dozen consultancies and agencies that were spawned? Many are doing a better job than when we were at their age. And I love that. Would you start a company if you didn’t possess “can-do”? Whether we developed that can-do attitude and capacity within our team, or were very good at attracting and recruiting people who already had it is a moot point. I suspect both were true, and that this deepened alignment. And for sure, a can-do culture in no small part emanated from a deeply held value from the founders of the company which went through the organisation, that of empowerment. Regardless, it meant that while we were together, we took on and delivered ambitious projects because we were mostly untethered from an impossibility locus. It made for a culture that not only made it an exciting place to work, but also added serious financial value to the company in many ways. And it probably was a key factor that helped us regularly top the New Media Age rankings. So I suspect if you asked any of our team which of our values or tenets of culture they recall, "can-do" would be resoundingly the one most remembered. So back to the start of this post. I’d encourage you to think - what value or principle or tenet of culture do your employees or co-workers hold above all others? Be honest. Is it a positive one? I've come across many companies which articulated a value in good faith, yet had it subverted through bad modelling and execution. So what is it? Is it the one you’re proudest of? If so, great! If not, what will you do about it? Many companies have articulated a set of values. Their role ranges from covering stains on company walls to actually defining how the company does things. In most companies, one value reigns supreme. What that value is depends mostly on how the company is led and the authenticity of that particular value. Sometimes it is a value that isn't articulated, but is the one that the founders or leaders demonstrate the most. Recommendation - take a hard look at the values your company is demonstrating, not the ones on the website. Which one defines how you work? Is it the one you'd want? If not, what can you do about it? Our membership programme offers owners and leaders of consultancies and agencies detailed training, templates and coaching on how to grow a Value/s Led Consultancy. Designed for companies with at least 5 billable employees and/or a turnover of £500,000, we cover strategies and practical implementation details for growth, scaling the company, and ensuring you create a positive culture as you grow. It is delivered by our founder, Iyas, based on his experience while growing a consultancy and Full Services Agency which was sold for £42m. Our next scheduled programme starts on to be confirmed. Contact us if you want to know more.. You can find more details here.